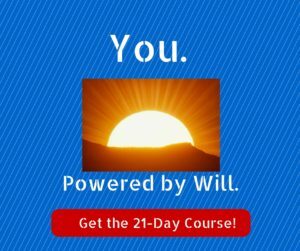 Exercising your Power of Will doesn’t have to be dramatic. Quite the opposite – when you are pursuing a goal, it’s the small, little steps that will get you to where you want to be. For example, we have a client who is rebranding his web business. He’s got big goals which means he is taking significant daily steps to achieve them. So when he came home from his day job to discover his web site was down he was only mildly alarmed. He called the web hosting company and got the answer he suspected – they were having problems with a new server configuration and were working on it. The customer service rep assured him all the sites would be back up before the evening was over. Now in years past this client might have panicked. Might even have gone on a tirade against the stupid company – maybe even written an angry tweet (that’ll show ‘em!). Instead, he reminded himself of his goal, and the commitment to exercising his Power of Will that he had established for himself. In his case, he has resolved to write a blog post a day for 30 days. He knew he could do this without the web site being operational. He does after all, have a word processing program. So that’s what he did – simply and calmly stuck to his Power of Will and kept his commitment to himself. The technical problem wasn’t within his range to solve. Being angry or worried about it wasn’t going to fix it either. So he decided to focus on what was within his control. Which was his own Power of Will. Instructions to start receiving the Power of Will email sequence. Remember, developing your own Power of Will, to make more money and achieve any of your other goals begins first with a decision – and then action! You will be directed to the Member’s Area. We hope to be able to greet you inside the Member’s Area today!